It is not cool to see the photos you shoot in RAW just disappeared from your camera or card. What if it really happens? What if your RAW files were deleted by accident, for your camera or memory card (SD card, CF card and such) that is used to store the files were formatted? How to recover the files? This article will tell you how to complete a RAW files recovery. RAW image, an image that contains unprocessed or undeveloped data, has been favored by many photographers, both professionals and enthusiasts. Working with RAW files allows you take full control over the image, letting you to determine how the final images should look like. However, RAW images must be post-processed, with the raw conversion software that come with your camera or other digital darkroom software. So it is definitely a disaster if you have lost the RAW files you took, and you will find that most of the RAW file recovery program you could find is running under Windows. How could you recover the RAW file from your camera or formatted card on Mac? Here is the solution, use Card Data Recovery for Mac. A powerful yet very easy to use tool, that will work wonders on the recovery of your RAW files on Mac. 2. Then select your target device, and click “Scan”. 3. After scanning you will be able to see all the files it has scanned. Highlight the file by clicking on it to preview, if you want to restore the files, hit “Recover”. 4. Then select a location to save the files to be recovered, and please don’t save the files directly onto your card. After it’s done, you will be able to see the recovered files and transfer them to wherever you want. Plus, if you are a Windows user, here is a windows version of Card Data Recovery for you to recover RAW files from camera or memory card. November 4, 2011 – Tenorshare Inc. software, the leading multimedia and PC utility software supplier who is dedicated to developing excellent tools in the field of multimedia and disk storage, releases the first version of Card Data Recovery for Mac which can recover lost, deleted or formatted data on Mac as well as other removable media devices like digital camera’s memory cards, USB, Pen drive, iPod, Macbook, etc. when use Mac OX operating system. Intuitive interface with file type divided: the Mac version divides data into four types: photo, video, music, others. Therefore, you can choose any type of the file to recover, which will largely save the scanning time for you have no need to scan all files. Preview files before recovery: Card Data Recovery for Mac allows you to preview photos and listen to music before recovery. It supports two preview modes: Thumbnail mode and Column mode. Recover data from various memory cards like SD card, mini SD card, micro SD card, CF card, MMC, XD-picture card, etc. and other storage devices like USB flash drive, Pen drive, floppy drive and so on. Recover lost data from devices with Mac OS X operating system including iPhone, iPad, iPod, iMac, MacBook, Mac, etc. Support Mac OS X 10.5, 10.6, 10.7 and common file systems (FAT12, FAT16, FAT32, NTFS, EXT2, EXT3, HFS, HFS+). 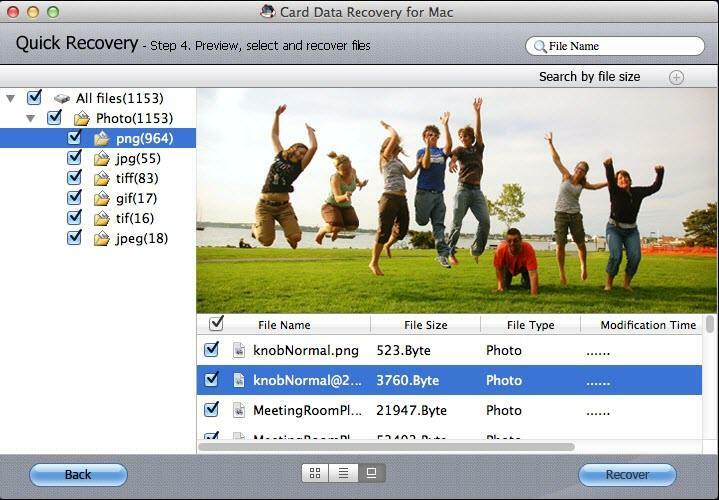 The image, video and audio supported by Card Data Recovery for Mac including: GIF, TIF, BMP, JPG, PNG, PSD, WMF, CR2, DNG, RAF, ERF, RAW, NEF, ORF, AVI, MPG, MOV, MPEG, ASF, MP4, 3GP, MTS, SWF, WMV, RM, WMA, OGG, AAC, MP3, WAV, etc. Card Data Recovery for Mac runs well under Mac OS X 10.5, 10.6, 10.7. The standard version costs as low as $29.95, and of course, you can try the demo version to preview the recoverable data. If you want to recover them, you will be kindly reminded to register for the full function.